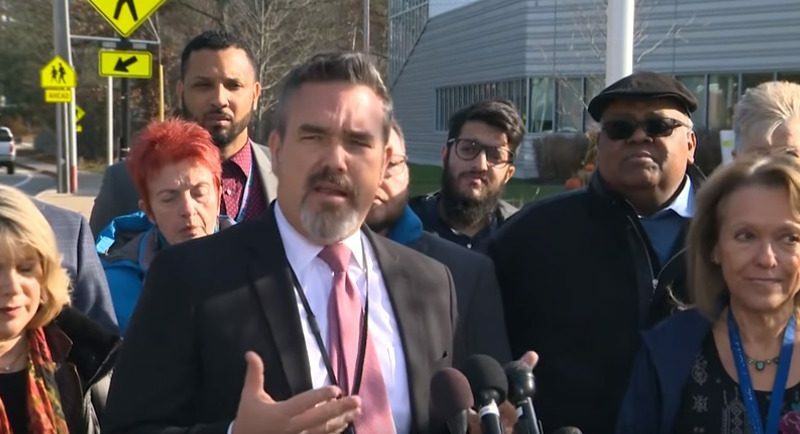 FRAMINGHAM – ‘There is absolutely no place for hate in our schools,” Framingham Superintendent of Schools Bob Tremblay told the media during a press conference held outside of the Christa McAuliffe Library this morning. The press conference was held a day after a second hate note was left for a fifth grade student at Hemenway Elementary School. The first note was left on Friday. The second note was left for the girl, 10, who is a Muslim, on Tuesday, after the long holiday weekend. Source was the first media outlet to publish about the hateful notes Tuesday afternoon. Standing with the Superintendent during the press conference, were many religious leaders in the City of Framingham. Tremblay said the district, along with Framingham Police, is investigating the notes. “We take this very seriously,” said Tremblay, who said the district has yet to identify who “authored” the note.